Profile: Kickback is as charming a guy as you'll ever meet - but it is a charm rooted in an uncommonly cruel cleverness. 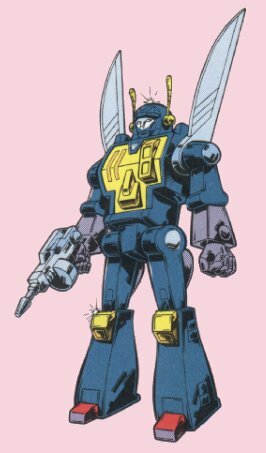 The singular purpose of any friendship that this Insecticon begins is to dig up embarrassing facts about the other robot or person so that Kickback can influence his "friend" into doing his bidding. Humans are particularly susceptible to his seductive talents, but even Autobots have been known to succumb. The only thing Kickback enjoys more than recruiting these unwilling double agents is destroying them after he's exhausted their usefulness. 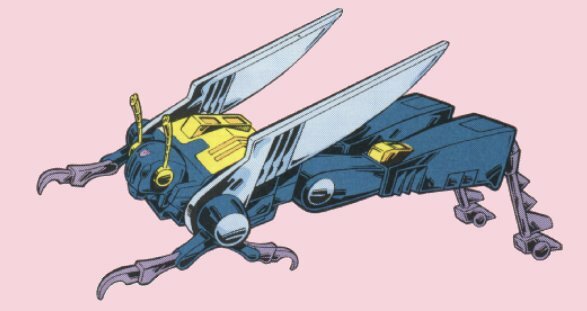 Abilities: In his insect mode, Kickback can use his powerful leg modules to propel him up to heights of 40 feet and over distances of a tenth of a mile. Although small in this form, a single kick of his can punch a hole in a ¼" steel plate. In robot form he can use his wings to fly at speeds up to 30 mph for distances up to 100 miles. He carries a sub-machine gun that can shoot up to 300 rounds per minute of armor-piercing titanium-coated bullets. Weaknesses: Kickback's lack of weaponry makes him extremely vulnerable in insect mode. The nature of his leaping and flying abilities hampers his mobility in moderate winds.